Today’s the first Thursday of the month which means it’s time for another Peanut Butter Bash recipe hop. 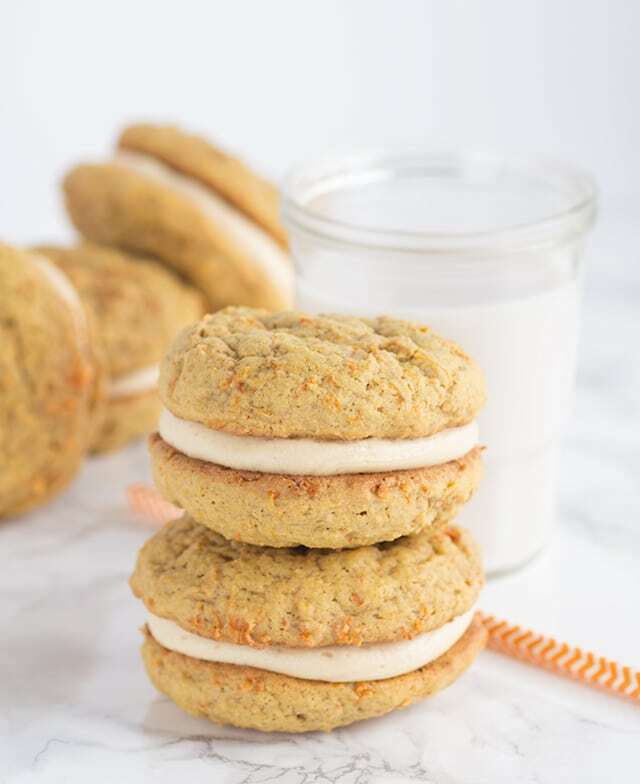 This month’s theme is peanut butter and carrots so I made these peanut butter carrot cake whoopie pies. Here are the things that I adore about these whoopie pies. They have peanut butter in them. 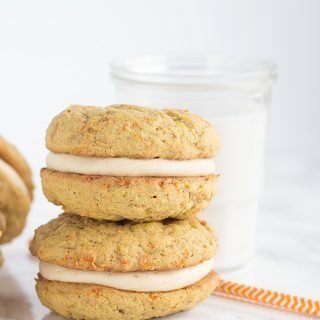 The cookies are so soft and the texture is heavenly, there’s ground ginger in them, AND peanut butter cream cheese frosting in between them. These are all things I thoroughly enjoy. So, I know carrot cake is often associated with Easter, but it’s after Easter now and I’m still making it. I know, I’m such a rebel, but I know you will love it so much. 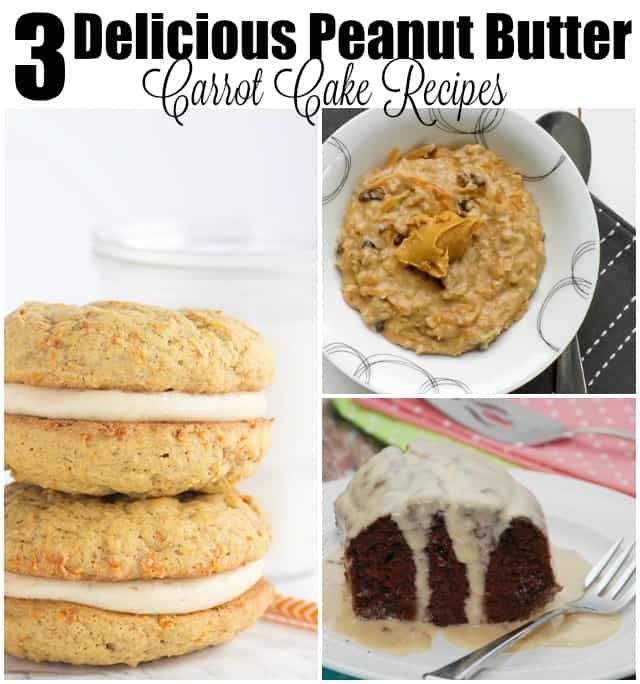 These taste like everything you want when you make a carrot cake. I’ll admit that when the peanut butter bash members decided on peanut butter and carrots I was a little worried. They aren’t normally two ingredients that I put together and judging by my google search not many people have thought to put them together. That’s okay, I don’t mind being different. In a large mixing bowl, add in the butter, peanut butter, brown sugar and granulated sugar. Mix on medium until light and fluffy. This will be about 2 minutes. Add in the egg and vanilla extract and mix until incorporated. Add in the baking soda, baking powder, salt, cinnamon, ginger and flour. Mix on low until most of the flour is incorporated. Add in the shredded carrots and finish mixing on medium until the carrots and flour have come together. Scoop the dough out onto the prepared cookie sheet. Place into the oven and let bake for 12 minutes. The bottom of the cookies will start to brown. Remove from the oven and let sit for 5 minutes. Place the cookies on the cooling rack to cool the rest of the way. In a mixing bowl, add in the butter, cream cheese and peanut butter. Mix until combined. Add in the powdered sugar and milk and mix until combined. Turn the mixer up on high and whip for another 1 minute. The frosting will become pale and fluffy. Place the frosting into a piping bag with a straight tip or a coupler. Add a swirl onto the bottom of the cooled cookie and place a cookie on top. Give it a little squeeze to squish the frosting out of the sides a little. Bloggers, do you want to join in on the peanut butter bash fun? If so, email me at [email protected] and request to join the Peanut Butter Bash facebook group! The first Thursday of each month we post a dessert/sweet with peanut butter and a mystery ingredient. 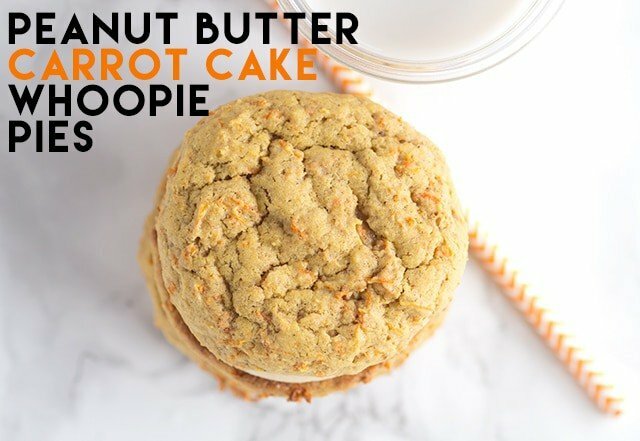 This month’s ingredients were peanut butter and carrot. 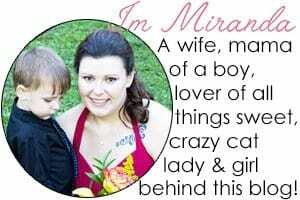 These look fabulous Miranda!!! 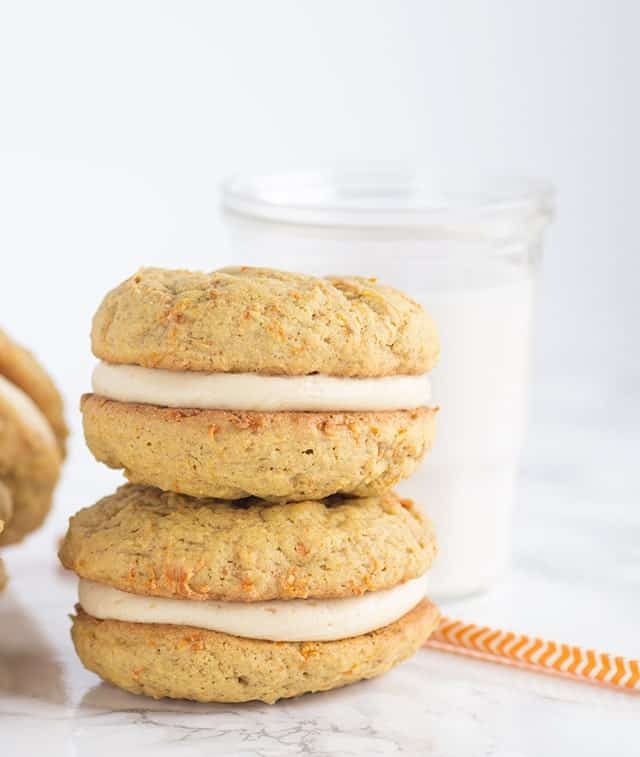 Taking whoopie pies to the next level…. Thanks Allie! They were some darn good whoopie pies! This sounds amazING! I love how different theses are – and since there are carrots, it’s pretty much a health food, right? Thank you Morgan! I like your thinking. These are a health food in my book! Wow, talk about delicious! These sound like they are rich goodness! I would probably want to eat a lot of them. Thanks for linking up with Delicious Dishes Link Party!